When holiday parties and gatherings fill your calendar, all the heavy dishes can leave you battling holiday weight gain. For a lighter twist on your traditional favorites, try serving up these tasty dishes. Try this lower fat version of your favorite spinach dip. By using nonfat yogurt instead of mayonnaise, and vegetables instead of chips, crackers or bread, you can reduce the calories substantially. So, dig in! Place all ingredients into a food processor or blender. Process until finely chopped. Chill two hours before serving, for flavors to blend. To serve: Place dip into an interesting container made from food — a hollowed out red pepper, a seeded acorn squash or eggplant. Surround the food bowl with raw vegetables to dip — from celery and carrots, to broccoli, mushrooms and cherry tomatoes. Trying to find another way to serve leftover ham? This colorful dish combines the sweet fruit flavors with the rich taste of ham. It looks great on the skewer, too. Drain pineapple chunks, reserving 3 tablespoons pineapple juice. Make marinade by combining reserved juice, vinegar, soy sauce, oil, honey and garlic. Take six 16-inch skewers and alternate the ham chunks, pineapple, green peppers and plums. Place kabobs on broiler pan and brush with marinade. Broil kabobs 4 to 5 inches away from heat, for 5 minutes. Turn, brush with more marinade, and broil 5 more minutes. Brush with marinade before serving. If you like to bake Christmas cookies, include this low-fat treat for guests watching their waistlines. Reduce calories further by substituting the sugar with the sugar replacement sucralose, brand name Splenda. It measures the same as sugar. Cream margarine and sugar in a mixing bowl until light and fluffy. Add egg substitute and vanilla and beat well. Combine flour and baking soda in separate bowl, mix well, and then add to the creamed mixture. Drop by teaspoon onto ungreased baking sheet. Bake for 10 to 12 minutes until cookies light golden brown. Cool. Make icing in small bowl. Beat together the powdered sugar, water, lemon extract and food coloring. Spread on cooled cookies. 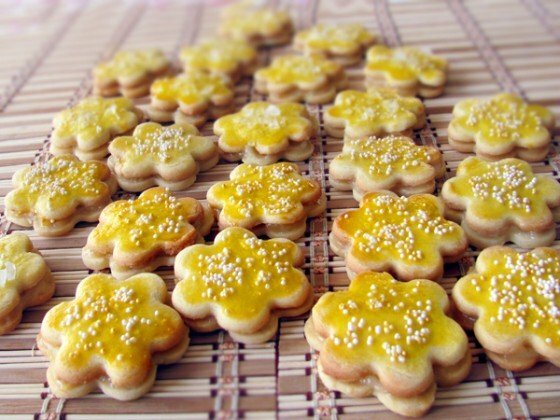 As for me, I choose only the cookies :D I prepare them fast and are delicious!